This past week our new(old ) logo was finished. In 2001 when the Internet was still relatively new my Sister Pansy and I developed a website to sell quilts and other quilted, items. We kept it up for several years, but not a lot of people were shopping on the Internet yet, so we dropped it. 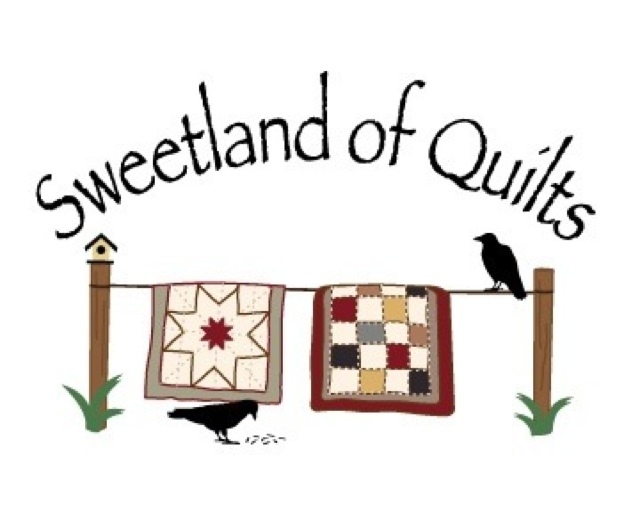 It was called "A Sweetland of Quilts.com". 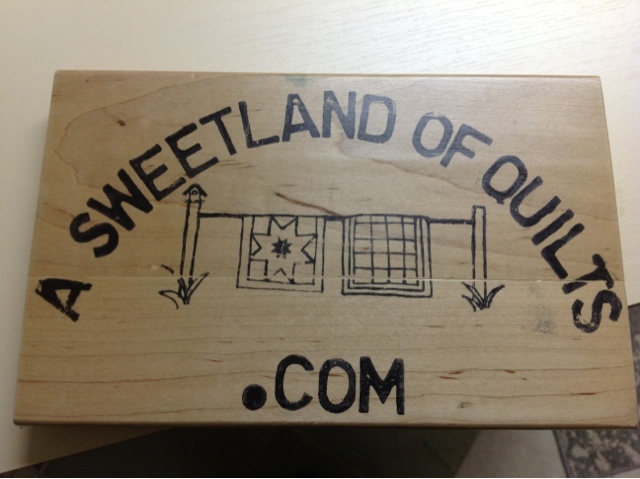 Pansy had drew out a design for our logo and had a stamp made . The idea was to make bags from muslin then stamp them with this logo. Here is a picture of the original and the new one done by a professional. I decided to use it for my business now to honor Pansy. This past week www.patternmart.com starting carrying my patterns for "Appliqué the Modern Way". These are super easy appliqué done on the domestic machine. Starting in the near future They will be available on my site also. After May 4 Th. there will be a free pattern to download for the Statler Stitcher that will be "Appliqué the Modern Way" for Longarm. This week is busy with the Quilting with Machine Show in Huron Ohio. September 19th - 22nd. Linda V Taylor will be the guest speaker on Friday night. She is considered the "Mother Of Longarm quilters, I am very excited in hearing her story. I am teaching a class on" Applique the Modern Way" It is a technique for applique on the Statler Computerized longarm quilting machine. I have developed several patterns for this and I will be demonstrating this in class. There will a lot vendors there so will be adding to my stash . Maybe I will see some of you there. This is the season for fairs! Locally we have one every week in the surrounding communities. We like to go and eat french fries, hot sausage and cotton candy.You get to see old friends and make new ones. I usually enter quilts and flowers, and my knitted items to have them judged to see how I stack up to the entries entered. Crawford County fair is the largest agriculture fair in the state of Pennsylvania and has many entries in all of the home department. I entered 11 items the first 3 pictures is a jacket that I digitized several years ago to sew out on my Gammill Statler. The large floral design is actually a panel made by the Micheal Miller fabric company. Our Statler group in Ohio had a challenge to that had no rules it just had to be quilted. It sat on my work table for 4 months and I didn't know what I was going to do with it 1 week to go and this popped into my head . I think that it turned out really well, the back was all free hand , there is thread painting in the flora and Mctavishing in the background.The white dots on the curls are crystals glued on. By the way it was a big hit at the Statler meeting. The pattern for the jacket is just a outline so you can use a allover design or freehand anything that you want in any of the pieces. If you would like to try this on your domestic machine take a jacket pattern trace onto fabric , sandwich top batting and backing and start quilting. If this intimidates you a little start with a 12 x 12 square and quilt this it does take practice. My little jacket won Best embellished garment at the show! It was a lot of fun to make and I won a gift Certificate at Fox's Sew and Vac one of my favorite stores. Labor Day is to celebrate the workers of America. I come from a working class family that worked in the steel mills of Western Pennsylvania and from their hard work and dedication much of a America was built. Our House has another reason to celebrate today! Our Daughter Andrea's boyfriend Seth has returned from a deployment of a year from Afghanistan in the Infantry. They came and visited with us for the weekend and we had a very enjoyable time. In honor of him I am posting the latest QOV quilt I did. The three pictures are from a quilt I just took off the frame. As of this week I hope to upload pictures of what I am quilting or have quilted. I will be sharing some new patterns over the next couple of weeks that I have designed to see what you think. I haven't been writing much lately , I think about it almost everyday but never get to it. It has been a very busy summer. how to use the text function. Everyone said they enjoyed it and loved the applique that I taught them how to do. This is one of the patterns and is available for the Statler it only takes 11/2 hours to complete . For the last 4 years I have been quilting for the Quilts of Valor organization . Their mission has been to supply lap quilts for wounded American Soldiers. I have lost count of how many I have quilted , every quilt top that I have quilted is made by a volunteer piercer then is shipped to me with the backing material to be quilted by me. I then supply the batting free of charge as does the piercer with the top and the backing. After I am done quilting the quilt I send it back to the piercer to bind and send onto the facility that QOV designates . One of my favorite piercers Bill K. Is in his seventies . He always sends me awesome quilt tops that are patriotic, pieced nicely ,and always well pressed. The table runner that is pictured was made by him to give to me. He said I would know a quilter to quilt it. (LOL). Please check them out at http://www.qovf.org. I am still finishing up my UFO,s Here is another quilt with a interesting story I will write about it next time. I have been at my mothers for a week enjoying the weather and the rest. Back to work tomorrow.